Collin Sexton Is No Longer Historically Bad. He May Even Be Good. Rookie Collin Sexton has become more efficient in his shot selection since the All-Star break. Of course that concern was just one of many problems for Cleveland at the time, as the team was trying to compete after losing the best player in the world. The Cavs opened the season 0-6 and swiftly fired coach Tyronn Lue. Kevin Love sustained a toe injury a week into the campaign and would miss the next three-plus months rehabbing after surgery. When those issues were either accepted or pushed to the sidelines, Sexton’s struggles became front and center. And merely calling them “struggles” would be putting it lightly. By one metric, Box Plus-Minus, the 20-year-old Sexton was posting the worst season in modern NBA history1 as recently as March 5. But that was then, and this is … three weeks later. And now Sexton somehow looks like a completely different player from the one he was before the All-Star break, not only better and far more efficient but also wired differently in terms of where he will and won’t shoot from. That ability to know when and where to pull the trigger was a factor in his teammates’ opinion of his game. Sexton said as much when asked what prompted the seemingly overnight shift in his play. “They scream and yell at me for pump-faking, taking the one dribble and shooting a midrange [jumper],” said Sexton, who’s taken 128 contested two-point jumpers, hitting just 34 percent. Whether or not that peer pressure was the catalyst for change, the difference has been stark as of late. Sexton 1.0 (before the All-Star break) was taking 39 percent of his attempts from midrange — a far higher share than that of the San Antonio Spurs as a team, which takes an NBA-high 28 percent of its shots from that range. Just 48 percent of Sexton’s shots before the break fit the Moreyball definition, coming either in the restricted area or from behind the arc. Sexton 2.0 has been a completely different player. 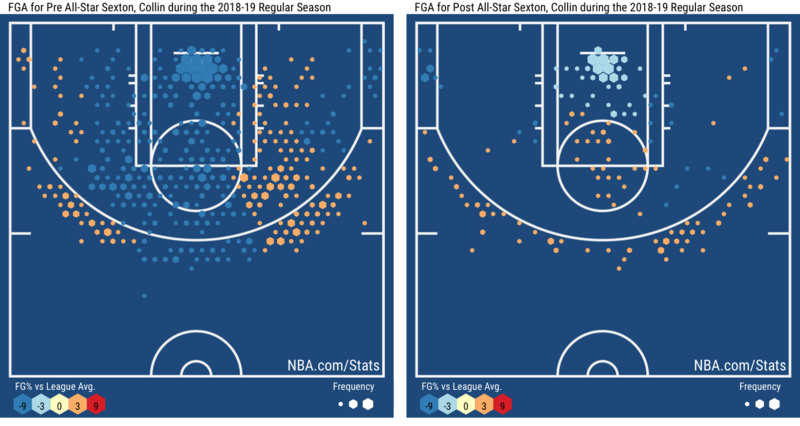 Since mid-February, more than 70 percent of Sexton’s shots have been from Moreyball areas — shot selection that resembles the analytics-friendly Atlanta Hawks. What’s more, the shots are now falling for Sexton, who had an effective field goal percentage of just 44 through the end of January2, but now is closer to a 54 percent effective field goal mark since then. And of the 56 players attempting at least five three-pointers a game3 since the break, Sexton ranks third in the NBA, at 44.8 percent from the arc. He recently pieced together an impressive streak of seven consecutive games in which he scored 23 points or more, becoming the first rookie since Tim Duncan, in 1998, to do so. And it’s clearly not a coincidence the team has played its best basketball of the season over the past two months, as Sexton’s play has vastly improved and Love has rejoined the lineup. The sweet shooting has been easiest to notice. But that part of Sexton’s game was never really the one in question. Whereas many young players struggle early on to find the basket, Sexton has been above average from deep for the majority of the year. If anything, his fledgling advanced metrics were weighed down by a number of factors that pointed to a lack of balance. Because of that, Cleveland’s league-worst defense allows a whopping 117 points per 100 possessions when Sexton is on the floor, up from a far more respectable 109.86 when he’s off, according to NBA Advanced Stats. The other shortcoming is Sexton’s lack of table-setting ability. Many remember the game in 2017, when Sexton’s Alabama team was forced to play 3-on-5 for the final 11 minutes because of multiple ejections stemming from a brawl with Minnesota. Sexton dropped 40 and the Crimson Tide came up just short in a thrilling comeback bid, outscoring the Gophers, 30-22, with a two-man disadvantage. During that contest, Sexton showed how much he could score when forced to score. But sometimes he plays that way even when he has four other teammates on the court. Aside from sometimes pulling the trigger too early or in heavily contested situations, Sexton also fails to consistently set up fellow Cavs compared to how often he calls his own number. In fact, you have to go back a full 30 years to find the last time a rookie point guard7 with a usage rate of 25 percent or higher who had an assist percentage worse than Sexton’s 15 percent mark this season, according to Basketball-Reference.com’s Play Index8. All of which could raise an interesting question for Cleveland’s front office in the near future: Is Sexton a true point guard, or does it make sense to use him as more a shooting guard and pair him with a Jrue Holiday-type, who can distribute and defend big lead guards more dependably? Given how much his game has grown in the last two months alone, it’s probably too soon to tell. But whatever Sexton’s shortcomings are, working through them probably feels like far less of a challenge when he can hang his hat on real, tangible progress from these past two months. And it certainly beats potentially going down as having had the worst season in modern NBA history. Among players who’d logged at least 2,000 minutes in a season. Sexton’s BPM — which measures a player’s value through his box-score contributions — on March 5 was -6.3. In a sign of his improved play lately, it now stands at -5.2. The league average for effective field percentage is 52.3. In at least 15 games played. Among players who’ve guarded at least 600 direct screens. Direct screens are ones that produce a shot shortly after the pick is set. Among players who logged at least 1,500 minutes in a season.